The only plant of hibiscus, I have, the hibiscus rosa sinensis-the red one, is also among the first batch of plants I brought when I moved to my new house. The plant, though, I had planted in a regular earthen pot, was thriving for some time, but, as it grew bigger, the pot, in which I planted it, started feeling small, with the roots of the hibiscus growing out of the pot, that appeared to me as the pot was too small for the roots to grow downwards, so the roots grew upwards and out of the pot. But during that time also, it never stopped blooming. 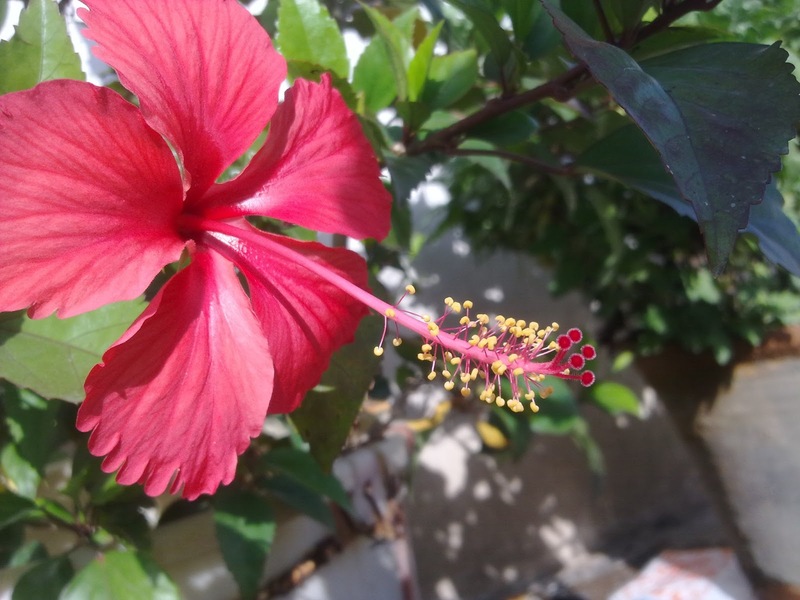 My experience, with the hibiscus says that it blooms only in summers and monsoon, with stunted growth in winters. Anyways, returning to the topic, of the hibiscus blooming, What I had, was pretty good flowers in red colour, though the size was not that great. As I was able to see the symptoms of the pot I had planted my hibiscus, getting congested for the growing hibiscus, I decided to remove it from the pot and replant it in another larger pot, or a larger vessel. I tried looking for a larger pot in the vicinity, but couldn't find one large enough, without shelling out hundreds of bucks. At that very time, I had a plastic bucket that stared leaking out, as it had aged. Since this was a good vessel for replanting my hibiscus, I used that bucket, filled it with a mixture of soil and vermi-compost, and replanted my hibiscus into this. And I suppose, that, worked for my hibiscus, and the results have been amazing since then. 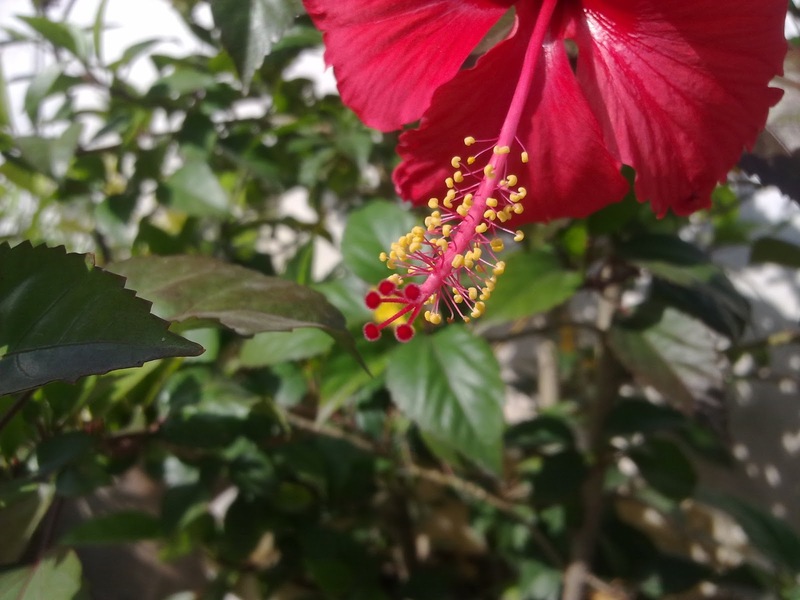 A flower of my hibiscus plant, after I replanted in a larger plastic bucket. A flower of my hibiscus plant, after I replanted in a larger plastic bucket. You can actually see the plastic bucket in the background, in which it is planted. 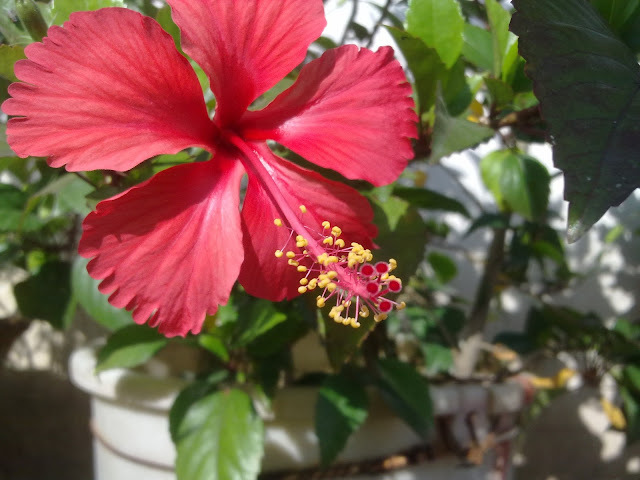 A flower of my hibiscus plant, after I replanted in a larger plastic bucket. Watchout for the shiny center, of the flower, which indicated a healthy blossom.